Marvin Nyenyezi is a banking professional with over ten years’ experience in the UK financial industry. He is passionate about helping young people make successful transitions from student life to fulfilling careers. It is this desire to help students that inspired him to write International Student Pathfinder - an essential guide for overseas students. He graduated from Cardiff University and went on to achieve post-graduate degrees from King’ College London and Cranfield School of Management. Although he managed to secure a graduate career, his journey was not without its hurdles. Every year, thousands of students are sold on the dream of overseas study expecting a rewarding career on completion. He was one of those who took the leap and invested in higher education in the UK. It was only after starting university that it became clear how difficult it was to transition into a successful graduate career. By the time students and graduates realize that they need to take action and work towards enhancing their career prospects, it is too late, and they have lost the advantage. With hindsight and experience, Marvin has gained a better understanding of the strategies that students can adopt to increase their chances for success their chosen graduate careers. In his book, he shares insights and advice about the strategies that have helped him and other graduates with prospective and current students. 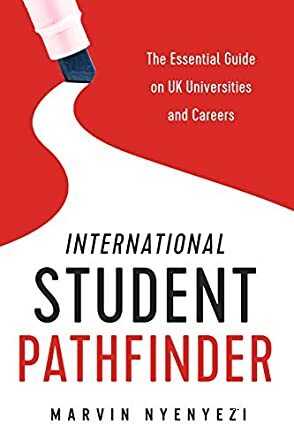 International Student Pathfinder: The Essential Guide on UK Universities and Careers is a nonfiction educational resource book written by Marvin Nyenyezi. Nyenyezi began his studies as an international student and is currently a banking professional who resides in the UK with his family. Studying overseas is an exciting adventure that can make one’s career dreams become a reality; however, it’s also a costly one that can lead to disappointment and long-term debt if one is not adequately prepared to make the most of those years of study. The author makes no recommendations about which school to attend or which course of study is the most likely to lead to success. What he does do is take the reader through the options and opportunities overseas study can bring, starting with that all-important selection of subject and place of learning. He then gives advice on how to make those years of study work most efficiently for you, and shows you how to set long-term goals for getting the job you’ve dreamed of after your schooling is completed. Marvin Nyenyezi’s nonfiction educational resource book is a well-written and highly informative guide that should be on any prospective student’s reading list, whether or not they are planning to study overseas. There is so much within the covers of this book that I wish I had been privy to when I was considering a course of study and my choice of colleges. Far too many students graduate and end up grabbing whatever job they can find, often not even remotely related to their course of study. The author sets out simple strategies designed to help students turn their career aspirations into real job offers. Those who hadn’t considered overseas study may well end up doing so after reading the author’s work as well as the student testimonials he provides throughout the book. I especially loved his Top Tips and Recaps sections, which work quite well at reinforcing the key aspects of the material covered. The material presented in his Appendices and Bibliography is also invaluable. International Student Pathfinder: The Essential Guide on UK Universities and Careers is most highly recommended. International Student Pathfinder: The Essential Guide on UK Universities and Careers by Marvin Nyenyezi contains advice that international students need. International students are attracted to UK universities and they come in their thousands from around the globe. Each student who gets admitted into a university looks at the future with hope, but at the end of their studies, the startling truth hits home: getting a job isn't as easy as it felt like at the start of the adventure. Students find themselves in fierce competition for graduate jobs. So how does a student get an edge over the others? The author shares practical wisdom and tips — from understanding the university system, to choosing the right university, to employment prospects. The author gives readers insights on what to expect when they enroll in UK universities and provides tools that not only ensure that candidates are successful in their academic endeavors but have access to the resources they need to succeed in their professional paths upon graduation. International Student Pathfinder is well researched by an expert in the field. The author shares a lot of knowledge with readers and the question of culture shock is discussed. Marvin Nyenyezi writes with simplicity and offers real-life examples while weaving interesting stories into the book. This is a guide for international students on the UK that helps them to understand their new world, make intelligent decisions, and gather the tools they need for a successful academic journey. It is packed with wisdom and insight and reflects the world international students need to know. International Student Pathfinder: The Essential Guide on UK Universities and Careers by Marvin Nyenyezi is a helpful manual for students who intend to pursue studies at UK universities. There is a lack of guidance for overseas students who come to universities in the UK. This book gives real-life perspectives to students by helping them navigate the twists in their career paths and boost their career prospects. The insights in this book are good for students when it comes to developing their plans to excel, and will guide them properly when it comes to choosing the right course, the right university, and preparation for a successful graduate career. The author's personal experiences make this book more tangible and will definitely help students to achieve career goals. The author handles a relevant topic extensively and methodically, making it easy for students while embarking on their student journey. The book covers topics that are related to choosing the university and course, how to prepare for internships and graduate job applications, real life stories from former international students which are helpful, and key topics relating to entrepreneurship and employment. The book has a chronological approach which comes in handy when it comes to planning at the initial stages itself. There are also references to international education agents, career advisors, and counselors that will help students to develop their career choices and skills by guiding them in the right way to meet the challenges they encounter.